Don't Passover the Berries this Easter! Whether hosting an Easter brunch or the family seder, make berries part of the festivities. They are colorful, healthy and delicious and take absolutely no prep time. Serve fresh raspberries, blueberries, strawberries, golden berries and blackberries alone or dressed up with a dairy or non-dairy topping. 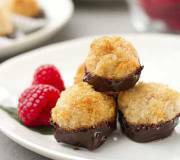 Enjoy sweet raspberry coconut macaroons covered in a chocolate shell. A treat your guests are guaranteed to love! Enjoy this refreshingly red sweet salad by combining a mixture of fresh greens, strawberries, raspberries, olives, tomatoes and feta cheese. The perfect summer salad for lunch or dinner. Click on recipes for this and other berry recipes. For over 30 years, Sun Belle berries have been a part of many family Seder dinners. 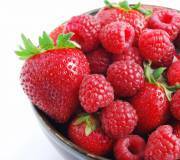 Our berries, during Passover, especially, raspberries, golden berries and blueberries continue to make delicious and healthy additions to your traditional meal as either part of a recipe or simply on eaten on their own. Most importantly, they are full of nutrients that are good for the many generations of family seated at your holiday table. 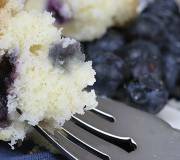 Click here for Passover recipes such as the Passover blueberry cake.